Here at Lindus Construction, we’re committed to making each customer a customer for life. It’s been nearly a decade since we completed our first project for Blaine, MN homeowners, Dan & Marilyn. The trees surrounding their 1970’s era home continued to flourish, routinely leading to clogged gutters. Uninterested in continuing to tackle this dangerous and messy chore, they opted to have us install LeafGuard® Brand Gutters. Accompanied with the Good Housekeeping Seal, a lifetime workmanship guarantee, and a no-clog warranty, they offer homeowners the ultimate peace of mind. As the years progressed, the couple continuously reached out to us to be their Blaine custom home remodeling company. The roof was less than a year old when it was damaged by hail. Roof: Sadly, Dan & Marilyn’s current roof was less than a year old when they were forced to submit a hail damage roof insurance claim. Again, they opted for Weathered Wood Timberline Ultra HD® shingles by North America’s largest manufacturer of roofing, GAF. 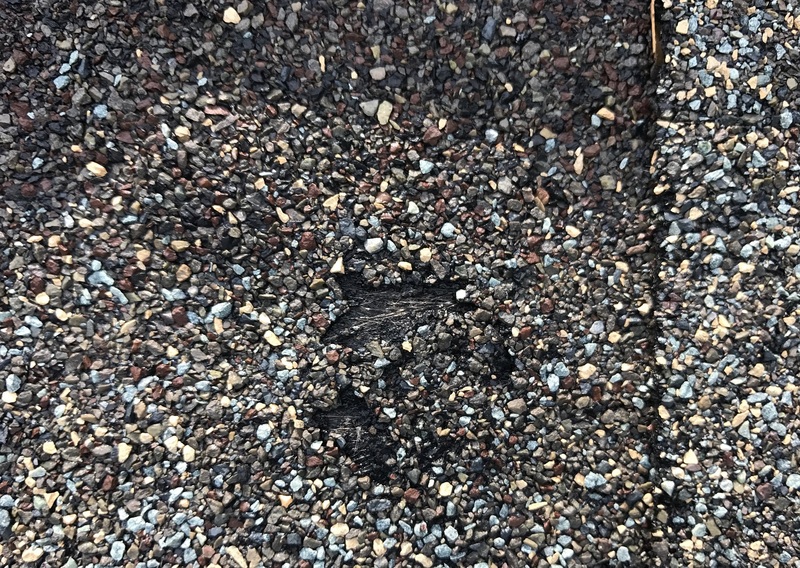 Fabricated in several layers, the shingles are attractive and stay looking that way because they come with StainGuard® protection which wards off the hideous algae that can grow on a roof. Homeowners that install this shingle appreciate the shingles’ ability to withstand winds of up to 130 mph. Deck: One of the features Dan & Marilyn had appreciated about their home when they purchased it was the beautiful backyard cedar deck. Through routine maintenance, they’d managed to get an impressive 25 year lifespan out of it. When it came time for replacement, they’d again opted for cedar. However, the contactor they entrusted the work to utilized builder grade materials and within ten years the cedar had rotted out. With the resolve to never have to replace their deck again, the couple asked for our assistance with composite deck designs. We suggested the use of AZEK® decking because of its stability and color-holding properties. The product is accompanied with a 30-year limited fade, stain, and limited lifetime warranty. When compared with traditional wood decking, AZEK® had a more flex feel to it when you walk on it. The color the couple selected was BrownStone and we utilized hidden fasteners and coated matching screws to give a look of continuity. To enhance the deck’s beauty and provide contrast, we encouraged the installation of custom fabricated FortressTM Aluminum black railings with 3” posts. For the deck footings, we installed a Diamond Pier system which is specifically built to withstand the freeze and thaw that happens annually in Minnesota better than an average concrete pier can. In addition, they’re installed easier and faster than conventional footings. Windows: The force of the hail caused the need for the home’s window wraps to be replaced, which presented the opportunity to install new energy efficient windows in areas of the home where they were needed. We suggested the installation of SeasonGuard casement windows. SeasonGuard vinyl windows come with triple pane glass and are lauded for their energy efficiency. They come with a long list of industry-leading warranties including one that covers glass breakage. 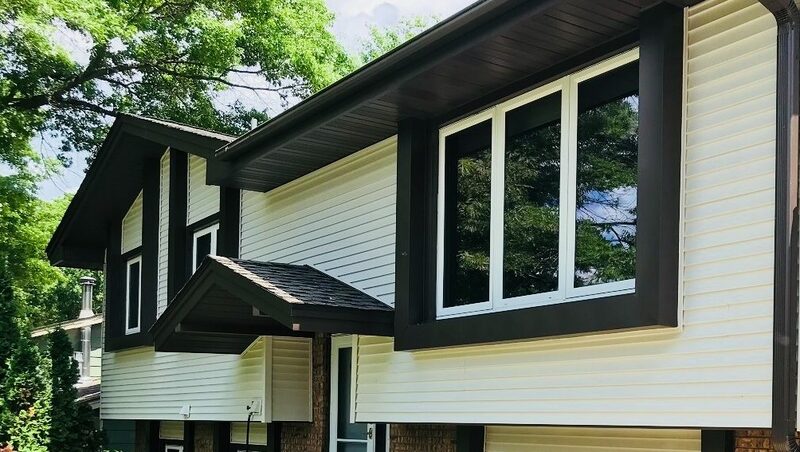 To complete the look of the exterior, the couple selected brown aluminum window wraps that matched their Musket Brown LeafGuard® Gutters. When asked to describe the status of her home’s preexisting wood deck, Joy used the word “decrepit”. Learn how our team remedied the situation with AZEK® composite decking!